This vegetable is sometimes referred to as the aristocrat of vegetables. Many Greeks and Romans not only appreciate asparagus for its taste but also believe it possesses medicinal properties from alleviating toothaches to preventing bee stings. Such things are mythical, but asparagus does contain a good supply of vitamins and minerals. Asparagus appears in markets as early as February, but the peak of this crop's season is in April and May. Asparagus can be found in green and white varieties. Green asparagus is the most common in the United States, while the white is more popular in Europe. White asparagus is grown under the soil. This does not allow the sun's rays to penetrate the plant, and therefore it does not produce the chlorophyll necessary to produce the green color. When eaten raw, white asparagus has a sweet, nutty taste. Choose firm yet tender stalks. For the green variety, choose stalks with deep green or purplish tips that are closed and compact. Avoid excessively sandy spears. Stalks with a narrow diameter may be more tender than thicker ones. Store stalks, with bottoms wrapped in a damp paper towel, in the crisper section of the refrigerator; if you don't have a crisper, put them in plastic bags and place them in the coldest part of the refrigerator. 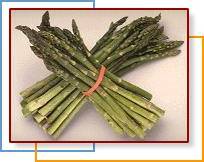 It is best to eat asparagus the day it is purchased, because the flavor lessens with each passing day. Wash asparagus in cool running water. Snap off tough ends at their natural breaking point. Before cooking white asparagus, it first must be peeled so that no skin remains. This can be done using a potato peeler. White asparagus needs to be cooked until completely tender, while the green variety can be stir-fried, lightly steamed or cooked in the microwave. Asparagus can be served cold with your favorite low-fat dressing or can be added to any salad. It can also be served as a tasty treat with fresh lemon juice. Steamed asparagus is always a nice addition to any meal, and any leftovers can be used to create delicious soup.